If you are dreaming of rustic comfort in the mountains or near your favorite lake, this log house plan delivers comfortable living designed for a view. The log exterior blends nicely with natural surroundings, making it well suited for wooded lots. Special elements like the sweeping deck and floor to ceiling windows encourage the enjoyment of nature. 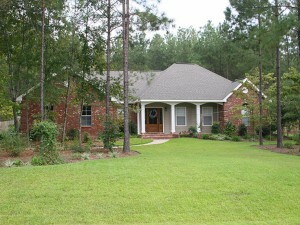 Just imagine stargazing on the deck with your loved one or listening to crickets and owls call after the sun has set. Now take a look at the floor plan. Stepping in from the covered from porch, the entry greets all with stunning views through the two-story great room and out to the rear deck. This spacious room encourages conversation and family time well spent with its relaxing atmosphere, toasty wood stove and immediate connection to the great outdoors. The vaulted kitchen connects with the great room and features a cooking island and a step-saving U-shaped design for convenience. Nearby, you’ll find a storage closet/pantry, the laundry room and access to the one-car garage. Fine appointments fill the master bedroom like the walk-in closet, vaulted ceiling and deluxe bath. For the children or your guests, the second floor holds a peaceful bedroom outfitted with a full bath and walk-in closet. Don’t miss the unique vaulted loft overlooking on the great room. A splendid home for those who love the outdoors and just right for a couple who enjoy weekend guests and visits from the grandkids, this log house plan is sure to get your attention. 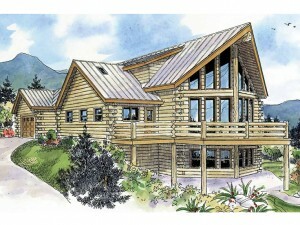 To browse more log house plans like this one, take a look at The House Plan Shop’s complete collection of log home floor plans. If you are planning to build a new house, it is important that you choose a floor plan that will satisfy your needs, as well as, accommodate your lifestyle and your phase of life. 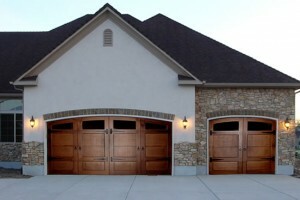 House blueprints are as diverse in exterior appearance as they are in size and layout. It is important to find the style of home you like along with a floor plan that fits well with your stage of life. Small and affordable house plans work well for couples starting out and those wishing to begin a family. These designs offer a modest square footage ranging from 1000-1800 square feet. They can be one or two levels and generally offer two or three bedrooms. The floor plans feature practical elements that support and promote family living like an open layout and an attached garage. They usually offer convenient and efficient features like a kitchen island, main floor laundry room and ample closet space, all elements a new family will appreciate. Couples and young families are sure to find an ideal floor plan for their starter home in our extensive house plan collection. Large and growing families are usually drawn to house plans with a greater square footage than that of most starter homes. These designs generally offer more than 1800 square feet of living space and three or more bedrooms. Maybe you’ve found a floor plan with four bedrooms, but only need three for your family. The extra bedroom can serve as a den, hobby room or guest room. Keeping family living in mind, the floor plans of larger homes deliver practical living spaces and often an open floor plan. Many include outdoor living areas such as a patio, covered porch, deck or screened porch. Larger home plans are different from starter homes in that that may offer additional living spaces not found in smaller homes such as formal living and dining areas as well as casual living and dining areas. Entertainment spaces such as a lower level game or recreation room or an upstairs home theater or playroom are common. These extra spaces give large families room to roam, quiet spaces to rest and relax and a place to entertain on special occasions. Singles and couples with no plans to raise a family might prefer homes designed for entertaining. For these homebuyers, there are floor plans designed with gatherings in mind. The floor plan may only include a master bedroom and a secondary bedroom for guests, but the living areas are stylish, spacious and comfortable. Often open floor plans incorporate and state of the art kitchen with an elegant great room and dining area while promoting conversation among guests. Decorative elements like special ceiling treatments and built-in elements such as a fireplace surrounded with shelves or cabinets enhance the gathering spaces, making them suitable for formal and informal get-togethers. Once the children are grown, retirees and empty nesters often opt to downsize from the larger homes in which they raised their families. At this point in life, retirees have an eye on their golden years and find their needs have gone back to the days when they were single or young couples starting out. Large homes require more upkeep and maintenance and higher utility bills that may not be feasible for retirees. Also, they need practical and functional rooms to satisfy daily needs. There is no sense in having a home theater or a rec room anymore if no one is going to enjoy it, so downsizing often makes sense. Furthermore, aging homebuilders are now focused on their future lifestyle and must consider potential health problems and mobility issues. Smaller ranch house plans are popular among retirees because they eliminate the need to climb stairs reducing the possibility of falling and make it easy for those with walkers or in wheelchairs to access all rooms in the home. Retirees often look for universal house plans that are handicap accessible offering wider hallway to accommodate scooters and wheel chairs, more spacious bathrooms with walk-in showers, and sometimes even lower counter tops that can be accessed while sitting in a wheel share or scooter. Seniors and retirees might opt to make their new home even safer and more practical by adding a security system that will alert the police and/or send medical help in the case of an emergency. Also, they can choose to install grab bars no-slip flooring and other special features that will keep them safe and in their homes for years to come. From a single or a young couple starting out to large families and empty nesters, The House Plan Shop, has an extensive collection of best selling home plans that are sure to satisfy every phase of life and every lifestyle. 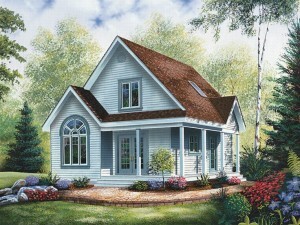 Exuding charm and style, this quaint cottage house plan is comfortable and efficient. Just imagine it in a little country town or along the New England coast delivering, peace and quiet with all the comforts of home. The exterior of this charming cottage is neatly trimmed and showcases a welcoming front porch lined with columns and opens to two sides of the home. Inside, you’ll discover and open floor plan perfect for the family to kick back and relax after a long week at work. It also encourages conversation with the kitchen and dining area connecting to the great room. Whether you bring the kids or grandkids or some of your closest friends, three bedrooms (one is an open loft) and two full baths deliver comfortable accommodations for everyone. Or, if you’re retired and prefer to spend a lot of time at your cozy cottage, this two-story cottage home plan makes a great secondary residence or vacation home with room for visitors. For more floor plans like this one, please browse The House Plan Shop’s complete collection of cottage house plans.